Maxillary sinuses are air-filled cavities that lie close to the upper back teeth. 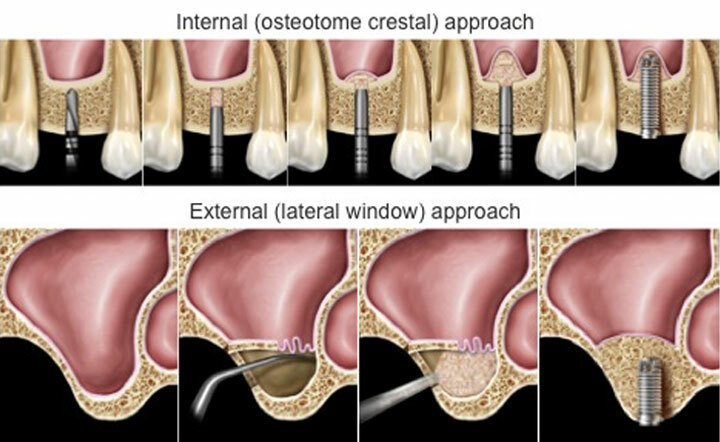 Sometimes there isn’t enough upper jaw bone for dental implants due to maxillary sinus enlargement (pneumatisation) or jaw bone resorption following tooth loss. Sinus augmentation (sinus lift) is a surgical procedure that predictably elevates the floor of the sinus to create adequate space for graft materials and implants. A sinus lift is a surgical procedure that lifts the floor of the sinus to create adequate space for graft materials and implants. There are two different techniques that can be used, and Dr Chou will discuss the relevant approach with you. Depending on the approach, Dr Chou may recommend using local or general anaesthesia.